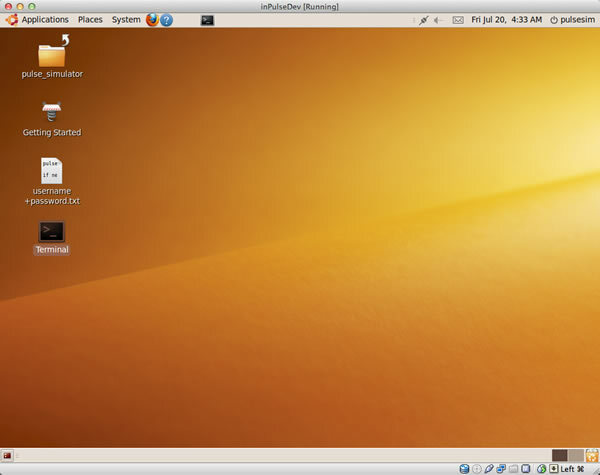 A computer that can run Oracle VM VirtualBox 4.1.x. You'll develop the app and run it in the simulator, all from within a virtual Linux environment, and you'll need Oracle VM VirtualBox to run that virtual Linux environment. If you go to the Oracle VM VirtualBox downloads page, you'll see all the operating systems it runs on: Windows 32- and 64-bit, Mac OS X, Solaris 10 and a fair number of Linux distributions (Debian, Fedora, Mandriva, openSUSE, Red Hat Enterprise Linux, SUSE and Ubuntu). Ideally, your computer should have at least 8GB of RAM. That's it! 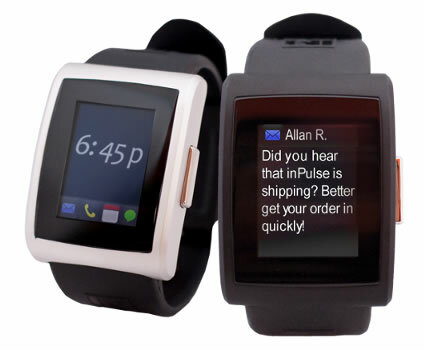 You won't even need an inPulse smartwatch. 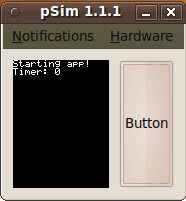 In this tutorial, you'll run all the apps in the simulator. Download and install VirtualBox, which you'll use to run the virtual machine image. Download and uncompress the virtual disk image, a virtual hard disk containing a complete Linux system that's already been set up with everything you need to start developing inPulse apps. This system will run in its own window as if it were another program running on your computer. 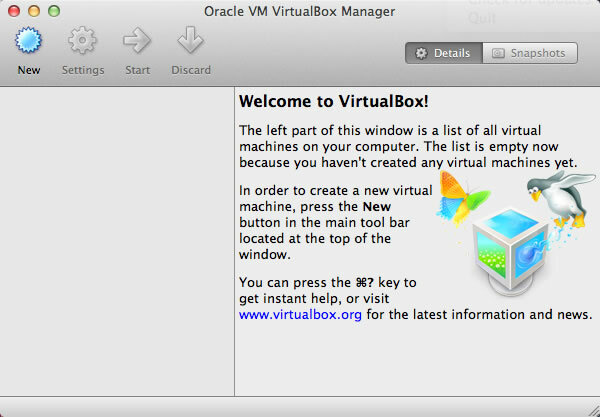 Go to the Oracle VM VirtualBox download page , look under the section marked Oracle VM VirtualBox for the link for the installer for your computer's operating system and click on it. 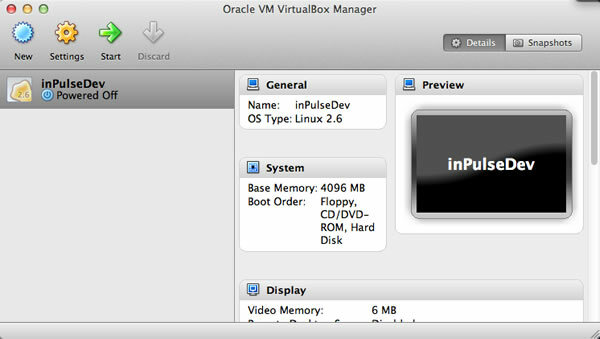 Double-click on the icon marked VirtualBox.mpkg to install Oracle VM VirtualBox. 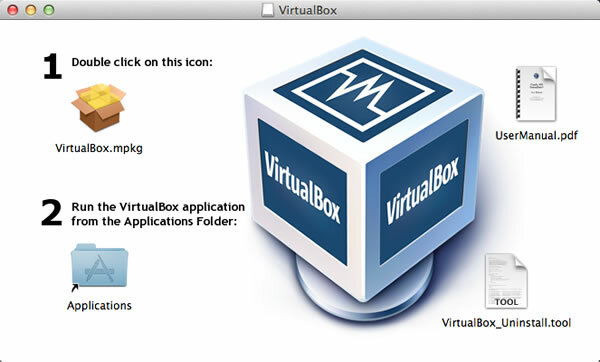 Once it's installed, open your Applications folder and double-click the VirtualBox icon to launch it. If your operating system is Windows, the installer will come as an executable (.exe) file. Double-click on its icon to start the installer, then launch VirtualBox from the Start menu. Download the compressed virtual disk image, inPulseSimulator.rar, then uncompress it. You might need to download a utility to uncompress .rar files, such as The Unarchiver for Mac OS or WinRAR or 7-Zip for Windows. The uncompressed file will have the filename inPulseSimulator.vdi. Put it in whatever directory you use to store your development work. 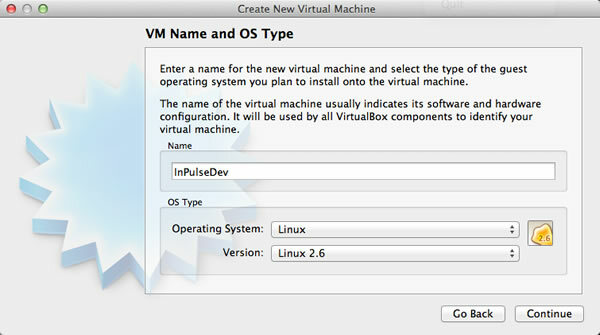 Give your virtual machine a name -- I chose inPulseDev, but you can name it however you like -- and enter it into the Name field. For the Operating System, select Linux. For the Version, select Linux 2.6. You'll be taken to the next step, where you specify the minimum amount of RAM to be allocated to the virtual machine. On my computer, an 8GB MacBook Pro, I gave the virtual machine 4096MB (4GB) of RAM. This setting seems to work well for both the Mac OS host and Linux running in the virtual machine. You can experiment and see if you get acceptable performance from the virtual machine with less RAM. 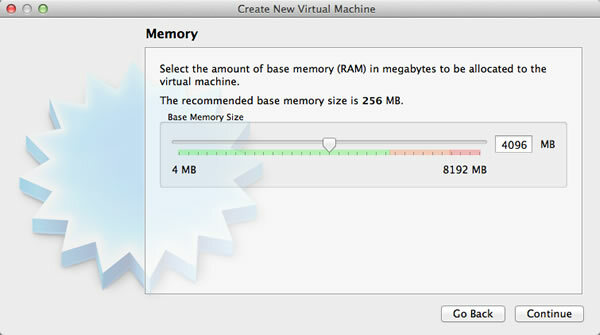 Once you've set the amount of RAM to be allocated to the virtual machine, click Continue. 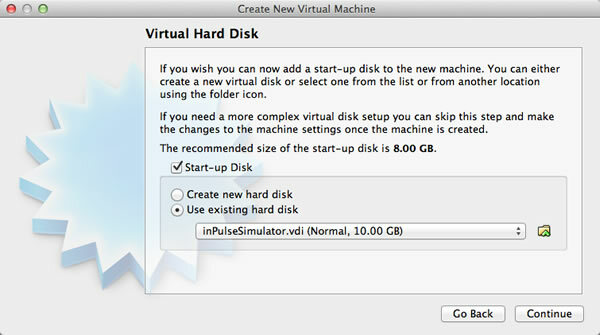 You'll be taken to the next step, where you set up a virtual hard disk. Click on the folder icon, use it to navigate to wherever you stored inPulseSimulator.vdi and select it. In the left pane of the window, you'll see the virtual machine you just created. It's time to start the virtual machine to confirm that it works. 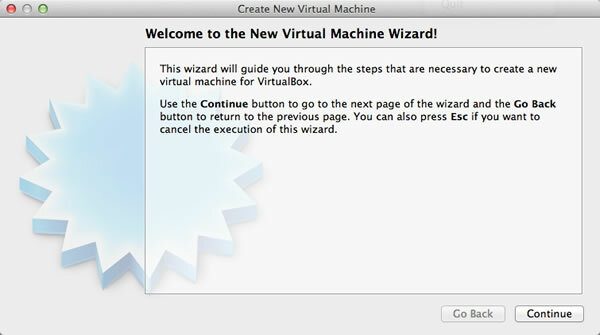 Click on the virtual machine to make sure it's selected, then click Start. The virtual machine will start booting up, just like a hardware machine would, only more quickly. Dismiss any dialog boxes that may appear during the startup process. 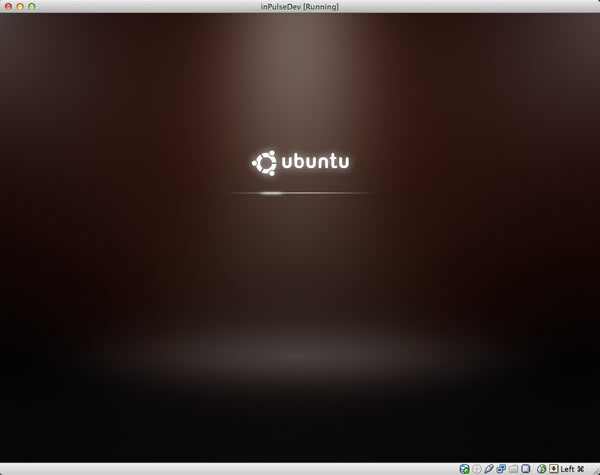 The virtual disk image contains an older, out-of-date version of Ubuntu that isn't supported anymore. 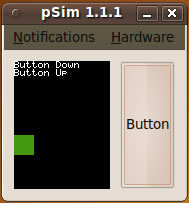 Don't let this bother you; this version is perfectly fine for running the development tools and the inPulse simulator. 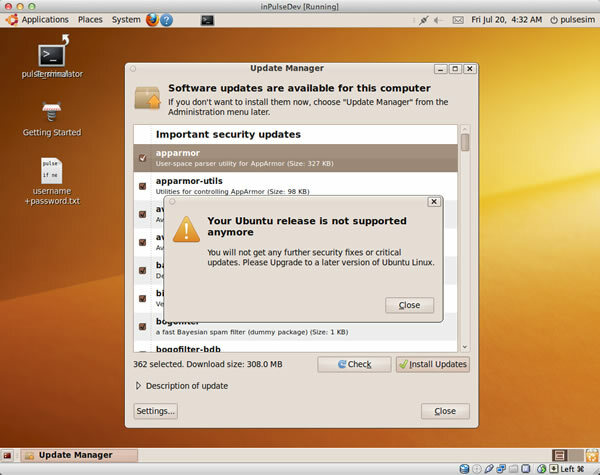 Dismiss the dialog box that says "Your Ubuntu release is not supported anymore" and close the Update Manager. You should now have a clear view of the desktop, which has four icons. One of the icons may be on top of another; rearrange the icons so that none of them overlap. Congratulations! 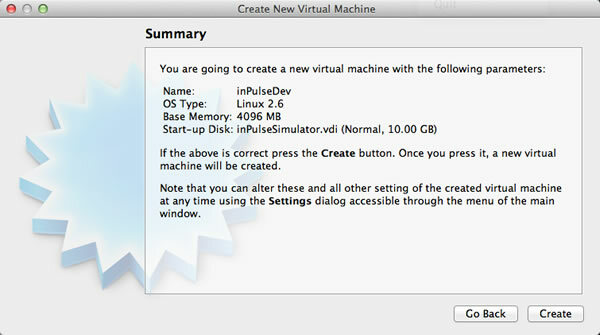 You've set up the virtual machine and are now ready to start writing inPulse apps. Before we start developing apps, let me show you how to shut down the virtual machine. 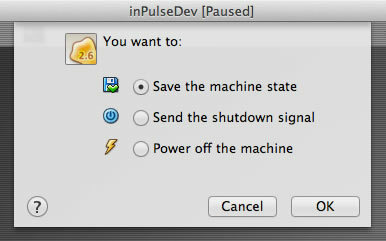 You can choose any of these options; pick the one you prefer and click OK to shut down the virtual machine. I prefer the Save the machine state option, which "freezes the virtual machine in time". When I start it again, restores the virtual machine to the exact same state as when I "froze it in time", running programs and all. pulse_simulator: A link to the directory containing the files you'll be using to develop apps, as well as some example code. 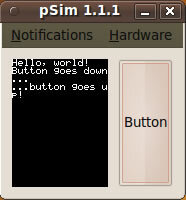 The actual directory is located at /home/pulsesim/pulse_simulator. When you start developing inPulse apps, you work in this directory. Getting Started: A link to inPulse's Getting Started with the inPulse Simulator web page. That topic is also covered in this tutorial. username+password.txt: A text file containing the username and password of the pulsesim user, which you might need from time to time. The username and password are the same: pulsesim. Terminal: A link to the command-line Terminal program, which you'll use to compile and run your apps. Makefile: Configures the make command, which you'll use to compile inPulse apps. src: The directory for source files. The code you write goes here. include: The directory for the header files that define inPulse's built-in functions and supported data types, which you'll need to include in your source code. build: The directory where your app, once compiled, goes. examples: A directory full of example code that you can use to learn more about inPulse programming. Before we do anything else, we need to make sure that the simulator is up to date. We'll do this by running the update_simulator script. Open the Terminal program. You can do this many ways; one way is to double-click on the Terminal icon on the desktop. The script will pause at a prompt where it asks replace pulse_simulator/Makefile? [y]es, [n]o, [A]ll, [N]one, [r]ename:. Enter A for all, since we want all the files to be updated. You'll see a large list of messages announcing files being decompressed and put into their proper directories. When the messages stop and you are returned to the command prompt, the update is complete. Now that we've got the development environment set up, let's see the simulator in action! 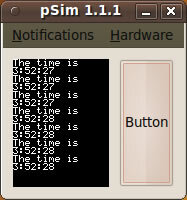 inPulse have set things up so that there's already a program ready to be compiled and run in the simulator. make uses the Makefile in this directory as instructions for compiling the source code, which is in the file pulse_app.c, which in turn is stored in the src directory. The resulting compiled file, pulse_app, is put into the build directory. The inPulse has a single button on its right side. 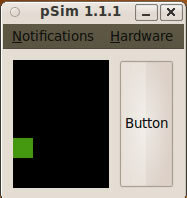 In the simulator, it's represented by the big button labelled Button on the right side of the window. The Button Down text appeared when you pressed down on the button, and the Button Up text appeared when you released it. This suggests that there's an event for each action, which you can use in your own apps. The function that prints text to the watch screen also prints to the terminal, which is handy for debugging. When vibrate is off, the menu bar is brown. When vibrate is on, the menu bar is blue. Your First inPulse App: "Hello, World!" We're going to start coding from here on in. You can type in the code yourself or copy and paste it, and if you want to download it, it's all available on this GitHub source page. 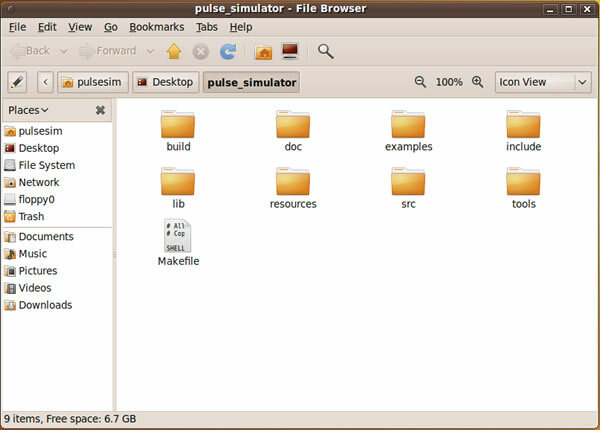 For all the exercises in this tutorial, we're going to be working on the pulse_app.c file, which is located in the src directory of pulse_simulator. Open pulse_app.c with the editor of your choice. If you prefer to use a GUI-based editor, navigate to pulse_app.c and double-click it. This will open the file in gEdit, Ubuntu's default GUI editor. pulse_app.c currently contains the code for the demo app we just ran. This code also exists in the examples/api_examples directory, in the file titled falling_box_using_main_loop.c, so we can overwrite it without worry. Since the Makefile is already set up to compile pulse_app.c, it's easiest just to use this file. // as well as responding to button events. // commented than your typical code. // Headers we'll need to program inPulse apps. //   vibration and so on. // the button and so on. // OS has been loaded and when the app is starting up. // Use this to initialize your app. // on the watch button. // watch button after having pressed it. // main_app_loop is a function that gets called regularly and frequently. // Use this for operations that your app will perform on a regular basis. // watch goes to sleep. // The sleep functionality is scheduled with pulse_update_power_down_timer. This is the skeleton -- a little framework that we'll flesh out throughout this exercise. Read the comments in the code, as they explain a lot. It runs, but since it's just a skeleton without any functioning code within, it's not doing anything you can see. Stop the app (either by closing the simulator window or typing control-C in the terminal). That's the easy part. The question is now "Where do we put that line of code?" In a desktop C program, you'd put it in the main function, but our inPulse app skeleton (and inPulse apps in general) doesn't have one. main_app_init: Called only once, when the watch boots up, the OS has been loaded and the app is starting up. main_app_handle_button_down: Called whenever the user presses down on the watch button. main_app_handle_button_up: Called whenever the user, after having pressed down on the watch button, releases it. main_app_loop: Called regularly as the watch continues to operate. main_app_handle_doz: Called at the time right before the watch is about to go into power-conserving sleep mode. main_app_handle_hardware_update: Called whenever certain hardware events, such as Bluetooth connection/disconnection or changes in battery charging status take place. Note that the text Hello, world! appears in the terminal. Any output created by printf will appear on both the simulator display and in the terminal. When the user releases the button, the watch should display the text ...button goes up! Note that this is different from the way the year is expressed in the tm structure of the standard <time.h> or <ctime> library, where this value is expressed as years since 1900. Clearing the display is pretty simple: a call to the API function pulse_blank_canvas does just that. // A skeleton for inPulse smartwatch apps. The main_app_loop handler is called regularly and often. If you're familiar with event-driven programming, think of it as being similar to a method called every time you go through the event loop. If you're familiar with game programming, think of it as being like a method called every time you go through the game loop. On my system, main_app_loop seems to get called about 5 times a second. I don't know anything about how the simulator was programmed, so it's possible that the rate at which mail_app_loop gets called may vary with the speed of your system. In the next example, we'll look at a "listener"-type use of main_app_loop. 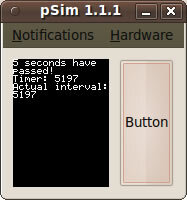 The main timer keeps track of the number of milliseconds since the watch (or simulator) has booted up. It continues to do so until the watch goes into sleep mode. When the watch wakes up, it resets to zero and starts counting the milliseconds since it woke up. You can get the main timer's count of milliseconds with the API function pulse_get_millis, which returns a value of type uint32_t. Display Starting app! on startup, along with the main timer's value at that time. Every 5 seconds from then on, it clears the display, announces that 5 seconds have passed and shows both the main timer's value at that time as well as the interval (in milliseconds) between this announcement and the previous one. As you can see, on my computer, the accuracy of the intervals is about off by a little under 200 milliseconds -- one-fifth of a second. This shouldn't be a surprise, as we determined in the previous exercise that on my computer, the main_app_loop handler gets called 5 times a second. With this single adjustment, the average interval is within 6 milliseconds of our target interval of 5 seconds. That's pretty good; 6 milliseconds is approximately the time it takes sound to travel 6 feet. It should normally display the current time, showing the hour, minutes and seconds. When the user presses the button down, the display should read Think of a yes-or-no question. 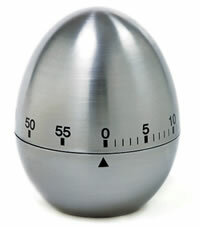 When the user releases the button, the display should show a "Magic 8-Ball" answer for 5 seconds, then return to its normal display of the current time. // A "Magic 8-ball" app for the inPulse smartwatch. // Normally, it displays the time in h:mm:ss format. In time mode, the app displays the current time. The time interval when we check to see if it's time to update the display is set to 900 milliseconds, just below a full second. In main_app_loop, we check to see if we've been waiting longer than that interval. If that's the case, it means that nearly a second has passed and it's time to update the time display, which we do in update_time_display. In answer mode, the app displays a random "Magic 8-ball" answer for 5 seconds (display_answer), after which it returns to time mode. The time interval when we check to see if it's time to switch back to time mode is set to 5000 milliseconds, which is 5 seconds. In main_app_loop, we check to see if we've been waiting longer than that interval. If that's the case, it means that 5 seconds have passed and it's time to change to time mode (set_time_mode) and then display the time (update_time_display). pulse_register_timer: This function sets up a timer that calls a specified function after a defined amount of time has passed. pulse_cancel_timer: This function cancels any timer that has been set up using pulse_register_timer. timeout_ms uint32_t The time, in milliseconds, that the registered timer wait until it goes off and calls the callback function. (* callback)(void *callback_data). The address of the function to be called when the timer goes off. data void* The data to be passed as a parameter to the callback function. It will start by displaying the message "Starting the timer". 5 seconds later, it should clear the display, show the message "Hello there!" and the number of milliseconds that have passed since the app started. It sets the timer interval for 5000 milliseconds -- 5 seconds. When the timer interval is reached, the timer calls the callback function, display_message. When calling the callback function, the timer passes it a parameter: Hello there!. For now, we're ignoring pulse_register_timer's return value; we'll get back to it after we run the app. The value below Main timer: is from pulse_get_millis, the main timer's count of milliseconds since the simulator started and the app started running. Note that the interval measured is a little more than 5 seconds -- on average, you'll that that there's a 200 millisecondthe offset is around 200 milliseconds, which is the same as the offset with the timing method we used in the Magic 8-Ball app above. pulse_register_timer can be used to register multiple timers. Here's an app that uses three timers, which are set to go off at 3, 5 and 7 seconds. Once again, we're ignoring pulse_register_timer's return values. pulse_register_time returns a value of type int32_t, which is a unique ID for the timer. This ID can be fed into pulse_cancel_timer to cancel that specific timer. Registers a timer that displays a message after 3 seconds have passed, saving its ID. Registers another time that displays a message after 5 seconds have passed. Cancels the first timer, using the ID that was saved. // functions to create and cancel timers. Here's what the simulator looks like about 3 seconds later. Note that the "3 seconds." message never appears, because the timer that would trigger it has been cancelled. And Now, Magic 8-Ball, With Timers! // InPulse Magic 8-Ball, Timer-Style! // from inside the main app loop. Time mode: The timer is set to 900 milliseconds, after which the display is updated with the current time with update_time_display, which also sets the mode to time mode. Answer mode: The time is set to 5000 milliseconds, during which the display shows the Magic 8-Ball answer generated when the user pressed the button. When 5000 milliseconds has elapsed, update_time_display is called, which clears the answer from the display, shows the current time and sets the mode back to time mode.